​Hours of operation: ​The park is closed during the winter months of December, January and February as well as Mondays and Tuesdays throughout the year, and also Thanksgiving Day, Christmas Eve, Christmas Day and New Year's Day. In early spring the park is open in March from 8 am to 5 pm and in April from 7 am to 6 pm. During the warm months of May through August the park is open 6 am to 8 pm. As the weather cools, the park is open in September and October from 7 am to 6 pm, and in November from 8 am to 5 pm. Directions: From I-40 in Greensboro take US 220 South about 3 miles to exit 94 for Old Randleman Rd. Turn right at Old Randleman Rd. and bear right at Kivett Dr. Go 0.7 mile to Drake Rd. and turn left. After about 2 miles Drake veers left. At this intersection continue straight on Wall Rd. Continue to follow Wall Rd., cross a bridge, and watch on the left for the park sign. 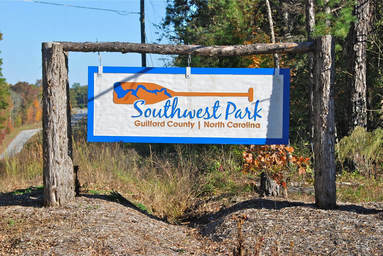 Southwest Park, one of the newest parks in the Guilford County parks system, is adjacent to the Randleman Reservoir. It is a 513-acre property owned and operated by Guilford County in conjunction with Piedmont Triad Regional Water Authority. There is a marina where a birder could launch a personal craft (no jet skis and gasoline motors) or rent a canoe, kayak, of jon boat and bird the shoreline and open lake. Check with the park office for marina hours. If a birder is coming from the east on Wall Rd., it would be worth checking the Great Blue Heron communal nesting site from the bridge in spring. A recent count recorded 27 active nests. The park has picnic shelters, playgrounds, ball fields, and a dog park. 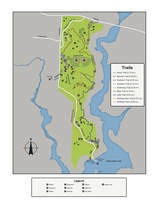 As of this writing there are seven designated trails ranging in length from 0.12 to 0.71 miles in length resulting in more than two and a half miles of trails for birders to explore, mostly through mixed pine and hardwood forest. The T. Gilbert Pearson Audubon Society, the Guilford County chapter of the National Audubon Society, funded and coordinated the construction of a birding platform that overlooked a wetland on Piedmont Triad Regional Water Authority property. This “overlook” was destroyed by arsonists recently. The organization plans to rebuild the structure in the near future. Because this is a relatively new park, bird species that occur here haven’t been thoroughly documented by local birders at the time of this writing. It will be fun to discover the bird species that are found in the park as birders become familiar with it.